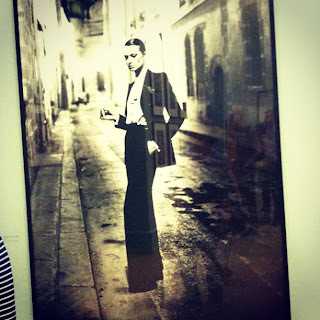 Last week a friend invited me to see the Helmut Newton exposition at the Grand Palais. It was a huge treat. Above you'll find Frames from the Edge, a documentary about Newton's work. Newton in many ways defines the photography of fashion: he captured its whimsy, semi-debauched fantasy and fairy tale demeanour. He was utterly unafraid of vulnerability, strength, ugliness or beauty, the blatantly commercial or the grittily banal; you have to be courageous to capture these things, to keep watching until you find them instead of blinking and pretending you didn't see. His celebrity portraits are also terribly revealing; in one shot he can capture the entire universe of a person, their allure or their insanity or their unexpected forged strength. 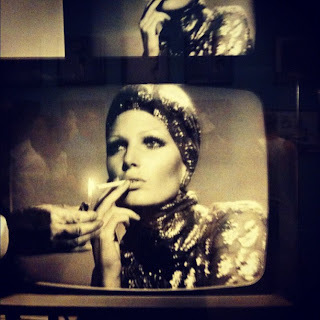 There is something kind and non judgmental about his camera eye; in front of it, the burlesque becomes a game of dress-up, naked women like little girls in Mummy's enormous fur coat, with shameless parading faces. Another thing I quite like about Newton is his refusal to buy into this notion of the fashion photograph as art. Bad taste drew him in, and unlike other great photogs, he didn't believe in limiting the number of his prints, in this notion that a picture could lose its soul if it became too present in the world. His imagery is like the fleur de lys: banalised, democratised and ever present, resonating long past the fashions and the times they were meant to represent. It's a characteristic advertising shares by necessity if not by preference: our work is naturally ephemeral, commercial, the furthest thing from the traditional definition of art. But that doesn't make what we do, what can be done, any less important or beautiful. If we could embrace what he did, maybe we'd find our immortality. Or perhaps the problem of immortality lies in accepting that it doesn't really mean anything, and we have to let that idea go. The top photo is of his wife June. I love the intimacy of it, the crass casualness. It's like spying on a naked cowboy. The middle shot is a classic YSL the way I still think of YSL: that woman, untouchable and so pristine that the fact of her existence, the very angles of her body seem to cut through space/time. And that last commercial photograph, with the man who reaches from outside of the screen to light a TV model's cigarette! I love that kind of play, its implications about our ongoing conversation, our own intimacy with media (and its stubborn insistence on protecting its space). Intimacy? I dont know — I always think of Helmut Newton's stuff as so mannered, affected, and controlled that it's almost anti-intimacy. I like the top image (of his wife), of course, but I would think it's mostly about flaunting distance (the observer's from her) than intimacy….